Blessing: Anath is a powerful goddess, especially in times of conflict. She protected other gods, the King, and the whole populace. 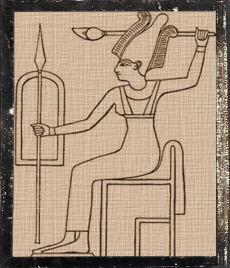 Although originally a Canaanite deity, she found her way into Egypt as early as the 16th Dynasty where she became a daughter of Re and consort of Set. Ways to honor: Be strong and fearless; defend the downtrodden.